Life can sure pack some wallops for us. Our loved ones pass away, relationships can deteriorate, people may betray or abandon us, we can become victims of cruelty, accidents and illness can strike us down, our bodies eventually age, we can fail in our careers or be rejected by our dream job… the list goes on and on. It’s easy to get lost in the suffering that often results. It’s easy to get caught up in wondering, “why me?” It’s easy to become discouraged and to give in to despair. It’s easy to shut down to avoid experiencing this pain again. It’s much harder to move through the suffering and come out the other side with a scarred but open heart. But this is where we discover the power in our brokenness. 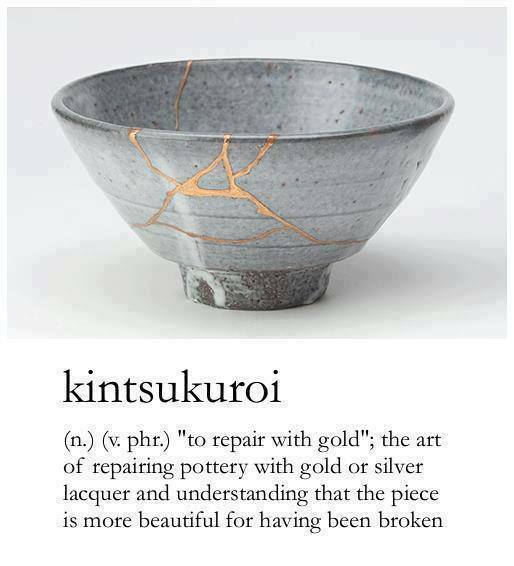 Like the gold or silver lacquer used to put the pot back together, that which we employ to weather our traumas in this way makes us more beautiful and radiant human beings. We transmute our suffering into compassion, love, and appreciation that we would otherwise never know. We become more open to our lives and see the beauty and value in that which we are given. We become trailblazers, giving others the power to weather their own suffering.